Along with my associate editor, Jared Kemling (Southern Illinois University), I am pleased to share with you this editorial team’s first issue of The Journal of School & Society. We thank the many members of the John Dewey Society who have supported us in this project as well as our contributors to this exciting issue. 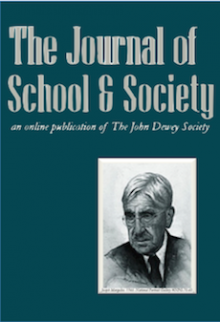 The John Dewey Society was founded in 1935. While the ideas and topics that interested Dewey are shared by many in our organization, as an editorial team, more than anything else, we seek to work in the spirit of the great American philosopher—and in particular, with his commitment to the use of the method of conjoint experience and communication for the enrichment of democratic living. TheJournal of School & Society seeks to position itself as speaking to all those interested in the place and function of education in a democratic society—to academics, certainly, but even more so to public school teachers, to parents, and to community and labor activists. To that end, we actively seek to highlight voices from diverse constituencies. We seek to be a journal of intelligent practice for creative and justice-oriented practitioners. To that end, this issue deals with the future of vocational education. The term “vocational education,” it seems, is quickly losing its popularity in favor of other terms and other trends: CTE (Career and Technical Education), POS (Programs of Study), and, perhaps most excitingly, the MakerSpaces that have been popping up in communities across the globe. A whole new way of working has brought with it a whole new way of learning to work. James R. Stone III, Director of the National Research Center for Career and Technical Education at Southern Regional Education Board, makes this abundantly clear in his article in this issue. Needless to say, Dewey would have rejected any such dualisms and asserted the importance of vocational education—rightly understood—for all learners. Pieces in this issue by Anthony DeFalco and Liu Xing make this point in compelling ways: any worthy educational endeavor must, it seems, have its cake and eat it too. It must combine appreciation of the past with readiness for the future, present enjoyment with future demands, individual gifts with social needs, and efficiency with equity. In our everyday lives, when pipes break, we need plumbers to fix them. But in a democracy, surely we need not just plumbers who know their work, but plumbers who carry with them a sense of their worth and purpose. Such is the story told by Karen Murphy, Communications Director of Michigan State Employees Association: of plumbers who rushed into Flint to install new filters and faucets for residents threatened by the lead poisoning of the city’s water. Can we appreciate the work done by these plumbers and, at the same time, deny them a fair wage? Can we appreciate their work and deny them the right to collectively organize? Can the new wave of vocational education concern itself with credentials but ignore issues of social justice? It must not. Those carrying out the work of CTE must ensure that this does not happen. We turn, then, ultimately, to those doing the work. Both k-12 public school teachers and community organizations are well represented in this issue. Erica Swinney of Manufacturing Renaissance tells the fascinating story of her organization’s work to partner with Chicago Public Schools in offering the very type of cutting-edge CTE that seems so promising to those working in the field: stacked credentials, long-term career counseling, and attention to the so-called “soft skills” that make a person a valued colleague, comrade and citizen—all in a Chicago community hard hit by the flight of manufacturing jobs and institutional racism. Where, indeed, will the next Grace Lee Boggs come from? Erica Swinney just might be able to tell us. From the classroom, we hear from John Denson, an agricultural teacher in Texas. Drawing upon his experience as both a parent and a classroom teacher, Denson points out the continued opportunities for learning as we help a new generation of farmers feed the world. Love of animals—something that seems almost inherent to our species—can, in the hands of a talented educator, be led into love of both agricultural methods and democratic purposes. It also builds traits of character—the lovely notion of “horse sense” that Denson speaks of—that serve young adults well in the future. We also hear from Diane Allerdyce in a wide-ranging interview with Natasha Perez—all in a video that has been wonderfully edited and produced by James Jackman. Allerdyce is a long-time John Dewey Society member and a founder of the Toussaint L'Ouverture High School for Arts & Social Justice in Delray Beach, Florida. In this interview with Perez, Allerdyce broadly considers how her incredible school contributes to “the vocation of being human” among a group of students who clearly have so much to offer the world. From the arts, to social justice, to career education, Allerdyce helps us consider of what a truly integrated school curriculum consists. Finally, we hear from Kevin Russell, a social studies educator turned manufacturing instructor. Russell helps us see how these two subjects, in the hands of the right educator, are actually not so far apart. They both aim to ready kids to transform their communities through work done in service to others. Russell lays bare for us the struggles that teachers will have to confront as they open themselves up to the idea that colleges—with their ever increasing tuition rates—might not open as many doors as they promise. That teachers might demonstrate to students the beauty and worth of many different life paths. What this means, then, is that vocational education—in the sense developed by the contributors across this issue—is a process that never ends. The excitement of vocational education can be sensed when we realize that each day brings opportunities for further growth and transformation—that today can be different than tomorrow, if our society values the human potential within all of its diverse members. Dewey understood this and he insisted upon honoring the diverse talents that each human being brings to the world. In his reconstruction of society, he called for new ways of working and serving, ones that would put learning at the forefront. This, then, is a vocational education worth pursuing. One that contributes to a life devoted to learning in, through, and for our work—broadly understood—all in pursuit of the common good. 1 John Dewey, Democracy and Education (New York: The Free Press, 1916/1997), 310. 2 John Dewey, Democracy and Education (New York: The Free Press, 1916/1997), 311.